Alaska's state flower is the alpine forget-me-not. It was chosen in 1949. 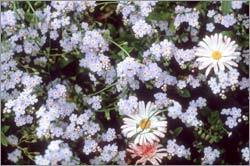 The alpine forget-me-not is a perennial that grows 5 to 12 inches high in alpine meadows. The flowers have five connected salviform petals, colored sky blue, that are a quarter to a third of an inch wide. They have a white inner ring and a yellow center. The best time to see the alpine forget-me-not is midsummer, from late June to late July. In addition to finding the Myosotis alpestris, botanists in Denali National Park might also come across the mountain forget-me-not (Eritrichium aretiodes) and the splendid forget-me-not (Eritrichium splendens).